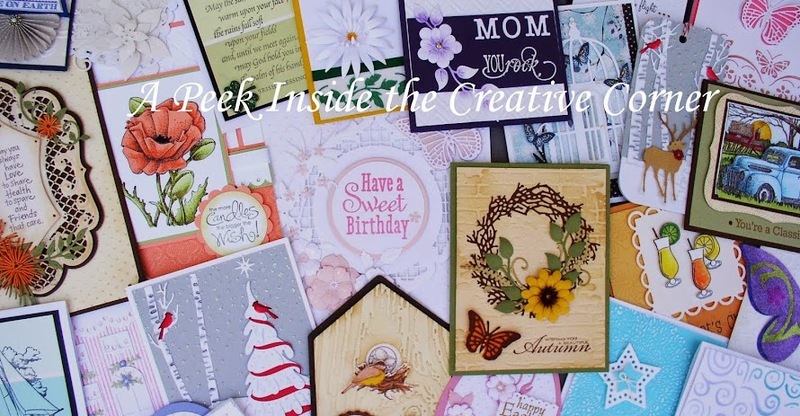 A Peek Inside The Creative Corner: Happy Engagement Card! I have been bursting with news and now I can finally post it!!! My daughter, Maria and her boyfriend Gary are now engaged!!! I'm so happy for them. About two weeks ago, Gary called me and asked for my blessing. And of course I said yes. "My goodness", I said, "I consider you my son already!" I then asked for some details and he told me that he was planning to pop the question when they would be vacationing at Myrtle Beach. I asked about the ring and he explained that he got it already, all by himself. He knew Maria wanted an emerald cut diamond; therefore he chose two smaller stones surrounding the main one. I right away had to think of a card design. 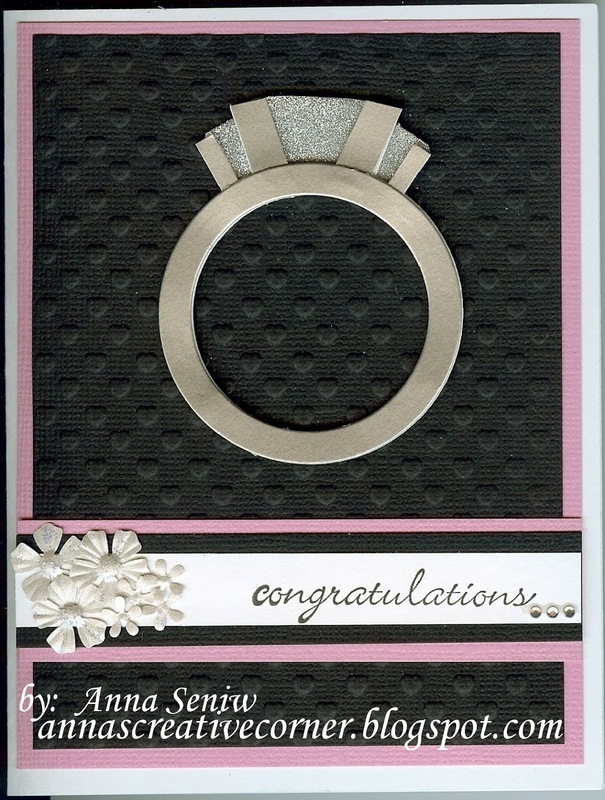 I remembered that a long time ago I saved a sample of an engagement ring card from the internet, in the hopes that one day, I could make one for her!.......................And here is what I came up with. It would have been easier to create a round solitaire stone, but as usual, Maria likes to be different, and I had to improvise. 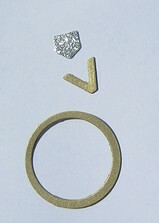 Below you can see the different parts of the round solitaire ring. I used Spellbinders Classic Circles Nestabilities to create the ring and then just cut some strips to the setting. Lastly, I used the silver, Elizabeth Crafts micro fine glitter for the stone. It really sparkles! I saved this before the days of Pinterest, so I don't know who originally posted this. But this shows you how simple it is to create a ring! Now, Shannon saw the card and suggested that you can use this design for someone's birthday and make the stone the color of the birth month. She is thinking of using ruby glitter to make a nice ruby ring! What a great idea! 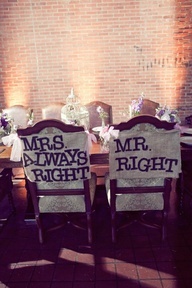 Now the wedding plans can begin!.........I found this on Pinterest.............and I asked Maria if I should start making these? You know me, I would need to decorate it.......maybe some hand made paper flowers for Mrs. Right and some golf clubs and tee flags for Mr. Right. Don't you think it would be just perfect?????? ?